Here is another recipe that was given to me by Denis Lambert. 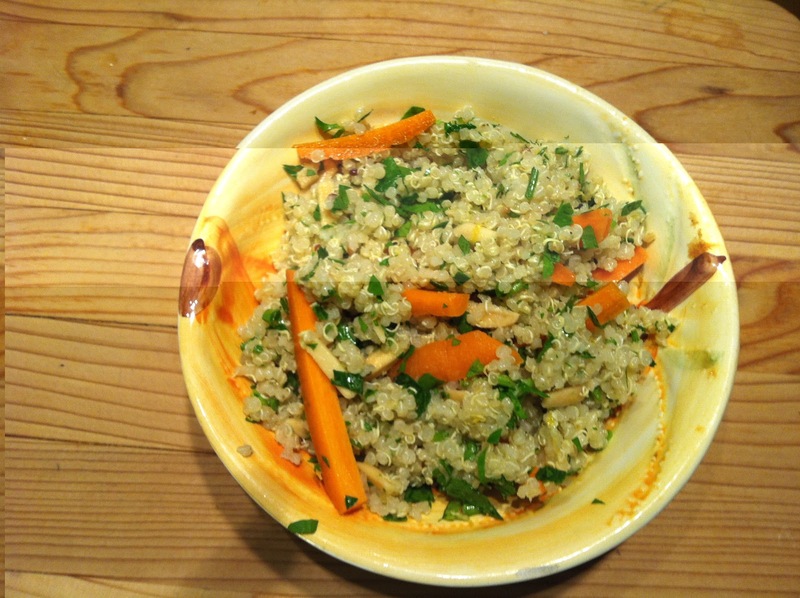 I did try it at home with just plain Quinoa and it turned out quite well. Pictures below. Chef's notes: This brightly colored and vibrant dish is perfect for this time of year. It is extremely versatile, you can personalize it by adding julienned broccoli stems, peeled. cored and diced cucumbers, dried cranberries or cherries, etc, etc, etc... If you wish to make a meal of it, add a cup or so of cooked garbanzo beans that have been drained, rinsed and marinated in a bit of olive oil and lemon juice. Don't be tempted to use bottled lemon juice with this dish. Combine the three quinoas in a large bowl and rinse THOROUGHLY until the rinse water runs clear. Add to a 4 qt. sauce pan. Add two cups of water and bring to a boil over med-high heat. Lower heat to a bare simmer and cook, covered, until most of the water has been absorbed and the quinoa still has a hint of bite left (about 15-18 minutes). Remove from the heat and let steam, covered, for another 5-8 minutes. Transfer back to the large bowl and cool uncovered to room temp. Add the carrots, slivered almonds, lemon zest, parsley, cilantro and toss to combine. Add the lemon juice and olive oil. Toss once again and season to taste with salt and pepper. Chill until ready to serve. Serve on a bed of raw spinach. Nutrition (per serving): 469 calories, 300 calories from fat, 34.1g total fat, 0mg cholesterol, 24.8mg sodium, 537.1mg potassium, 35.9g carbohydrates, 4.8g fiber, <1g sugar, 8g protein. Excellent! Please let me know how you like it.